Agarwood referes to an occasional product of a few genera of Aquilaria and Gyrinops in the plant family Thymelaeaceae. - Agarwood is exported in various forms viz. wood chips, powder, oil, end products like perfumes, incense and medicines. - First-grade agarwood is one of the most expensive natural raw materials in the world. In 2010, the price for superior pure material was as high as $100,000 / kg. • Commercially available agarwood is derived from fungus-infected trees through wounds caused by species of Aspergillus, Fusarium, Penicillium, and Fungi imperfecti. Palisan is a shrub or small tree, growing to a height of 5 meters. Bark is ashy gray, mottled, and smooth. Leaves are alternate, smooth, elliptically oblong, about 15 centimeters long and 4-6 centimeters wide at the largest, with pointed tip and a blunt or rounded base. Flowers are yellowish, about 1.5 centimeters long, borne in fairly small, rounded clusters. 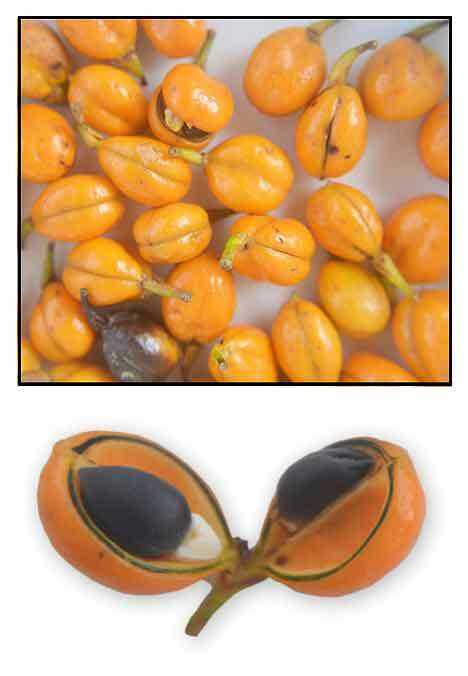 Fruit is pendant and orange-red, containing a single seed and two locules across which it splits upon opening, slightly obovoid or broadly ellipsoid and about 1.5 centimeters long. Seeds are ovoidly compressed, about 7.5 millimeters long. - Found in primary forests at low and medium altitudes in Nueva Ecija, Bulacan, Quezon, Laguna, Camarines, and Albay Provinces in Luzon; and in Catanduanes, Samar, Sibuyan, Leyte, Panay, Mindanao, and Jolo. - Also occurs in Indonesia and Papua New Guinea. - The species is considered a source of agarwood. - Agarwood is the resinous hardwood that is formed in Aquilaria and Gyrinop trees when they are invaded by mold. - Considered hemostatic, carminative, heart stimulant, and tonic. 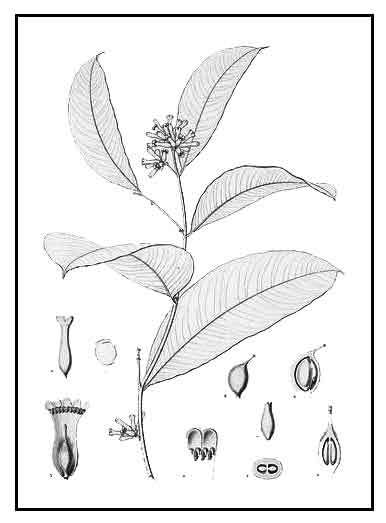 • Bark and roots used for stopping the flow of blood from wounds. • Bark, wood and fruit used as substitute for quinine. • Agarwood / Agar / Oleoresin: Agarwood is a dark resinous heartwood that forms in Aquilaria and Gyrinops trees in the family Thymelaeaceae. There are 17 species of Aquilaria known to produce agarwood. The best known among them are A. agollocha, a. malaccensis, and A. crassna. 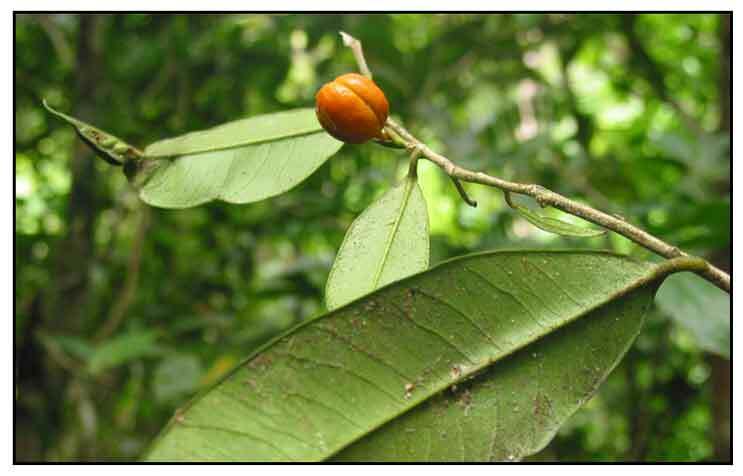 Agarwood-producing Aquilaria species found in the Philippines are A. apicultina (Mindanao), A. acuminata, A. cumingiana, and A. filarial. A dark aromatic resin is produced in response to induction/infection. The yield of agar, an oleoresin, is dependent on the plant species and the infection/induction involved. Ascomycetous mold, Phaeoacremonium parasitica, a dermatiaceous fungus has been identified as one of the known fungi associated with agarwood formation. • DNA Barcoding: Study reports on a DNA barcoding technique to generate barcode sequences for Aquilaria species for application in the identification of sources speciex of agarwood in the market. - Exported from source countries as wood chips, powder, essential oil,, or as finished products. AGARWOOD PRODUCTION- A MULTIDISCIPLINARY FIELD TO BE EXPLORED IN BANGLADESH / Selina Akter, Md. Tanvir Islam, Mohd Zulkefeli, Sirajul Islam Khan / International Journal of Pharmaceutical and Life Sciences, January 2013; 1(4) Serial 3. Aquilaria cumingiana / IUCN Red List of Threatened Species.